Have you ever worked on a deal that involved multiple people, multiple documents, and quite a few details and steps that had to be executed all in the right order? If you have, then you know the value of a good organizational system. Have you ever entered a bunch of details and comments into one system only to then have to copy them over, or worse, re-enter them into another entirely different system at a later time? If you have, then you know the value of an integrated system where everything you need is in that one system only. Have you ever had a case where your computer crashed when you needed it most, and you lost your information, or you lost your notebook, or a contract and couldn’t find it when you needed it? Then you know the value of a system that resides in the cloud, is automatically backed up, and where you can upload an unlimited amount of files, pictures, notes and documents so that you never lose them again – ever. Have you ever lost overview of which deal was in what stage, or what letter you needed to send to which portion of your prospects? Then you know the value of a system that has built-in reports, property stages and statuses, and allows you to customize it to your every need. And here's the great news; all these features, benefits, and functions have been elegantly combined into ONE real estate CRM management system designed for land and house deals. 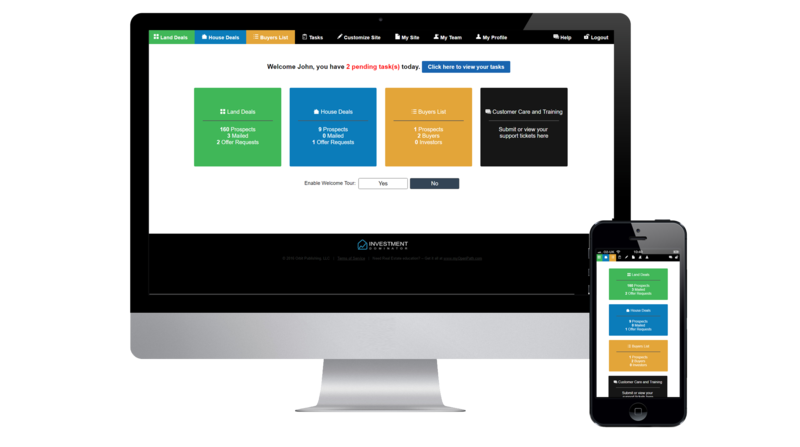 The Investment Dominator is the most powerful, effective, and customizable Deal Management, and Automation CRM (Customer Relationship Management) system available on the market today. But this system is so much more. First of all, the Investment Dominator is unlike ANY other system on the market because it is really TWO applications in one. It has a HOUSE and a separate LAND application and allows you to instantly toggle back and forth between the two of them depending on your need or the kind of deal you working on at the moment. With that, it is the ONLY such system on the market that has a dedicated area for LAND deals --making it PERFECTLY suited for those who follow any Land Investment system including Jack Bosch's Land Profit Generator, or one of his many Land Programs inside the myOpenPath.com educational platform. But that's not all either. In addition to being set up by default for both land and house deals you can easily modify many areas of the program to handle just about any sort of real estate transaction imaginable. No more settling for sub-par solutions. With this system your data, deals and deal flow will be automatically organized in a way that allows you to do more deals with less time and effort. But it doesn't end there, actually that is just the beginning. Once you entered the details of a property, including it's address or zip code you get detailed COMPS (comparable) property listings from some of the most popular real estate websites presented to you at your fingertips. No more need to open 5 different brower tabs and initiate a cumbersome search for likekind properties... it's all there for you inside the Investment Dominator. But the Good news doesn't end here. The next piece of functionality will really blow you away. Most CRM and Deal Management Systems on the market are just that. They manage the customers, and perhaps allow you to put in some information about the property... and the better ones even allow you to pass properties through various stages (although usually you have to change your ways to adjust to whatever they call their stages). ALL-IN-ONE integration of not just ONE, but THREE different websites in the exact same program. What sets the Investment Dominator apart is its integration with websites that come pre-built for you and the level of customization that it offers. You can adjust the appearance (look and feel), text, and domain of the websites (running it under YOUR DREAM domain name), choose custom statuses for your leads, and can create custom documents with merge fields and one-click printing. And to more efficiently track the effectiveness of marketing campaigns when selling your properties. Once you have printed your letters and sent them out, you just wait for the owners to contact you back and request an offer. 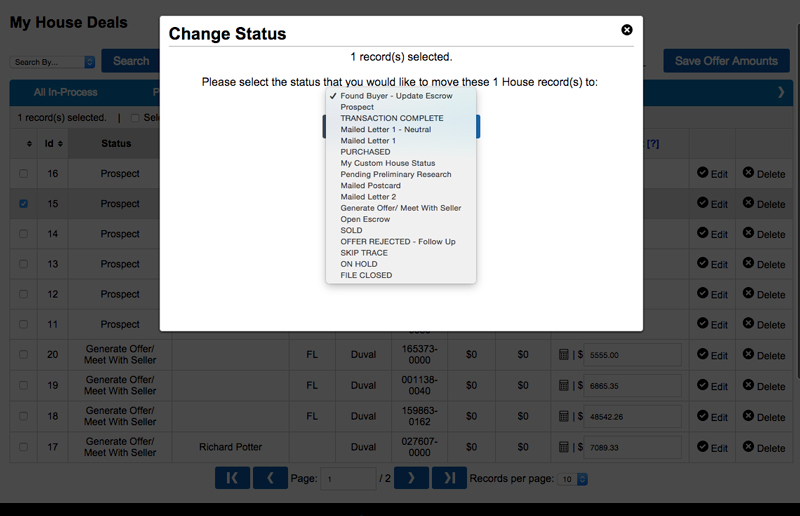 When they do, you can look up their record with a few clicks, input some additional data into it, and then move the "deal" to the next status - "Pending Preliminary Research." As you move through each (customizable) stage of the process - from making offers, to closing on the property, to marketing the property - you update the record in the system. 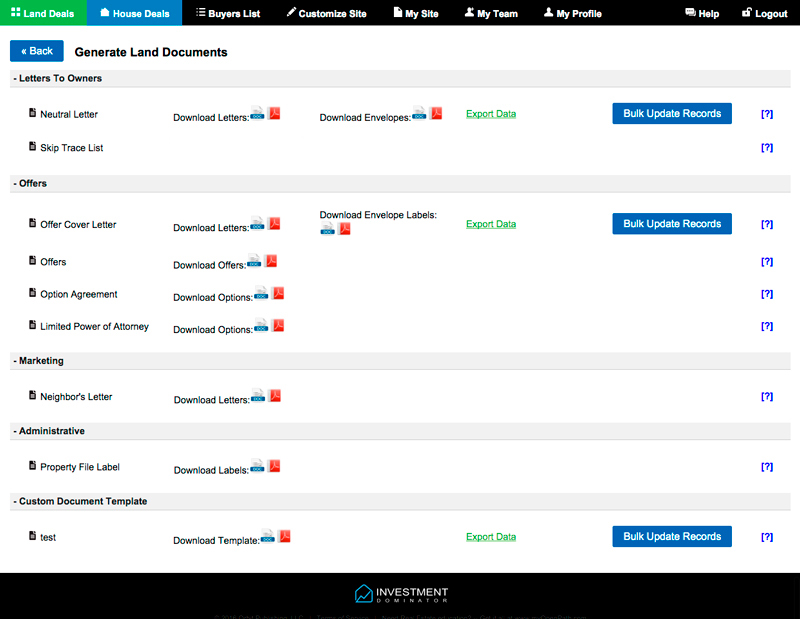 Bottom line is, the Investment Dominator is the only CRM designed from the ground up to be flexible, allowing for LAND and HOUSE deals to be treated as they should be, DIFFERENT, and totally customizable and to help real estate investors to become more effective. It's a critical tool that gives you the ability to scale to up your business to manage more deals with less time and effort than ever before. Quickly find property comparable to help in establishing market value (yes, even for land)! Easily manage and maintain both your buying and selling (mobile friendly) websites - no coding (or dealing with coders) required - EVER! Create trackable marketing campaigns that allow you to see the effectiveness and ROI of a specific marketing campaign years after you run them! GET and POST data through our comprehensive API that allows you secure external access to the Owner, Property and Contact data tables. The built in features are all very helpful. You can tell Investment Dominator is designed by people who are doing the business. If you are serious about real growth and doing more than a few letters and deals a month you have to have a system. Since this business is a "game of numbers" you have to be able to effectively and efficiently deal with large numbers." This helps with the tracking and systemizing of the overall processes." I like the websites - It saves me the time of building it myself." I like the reports that show where our deals are in the process. It gives a quick overview as to what is happening in the business." The best feature of the Investment Dominator is that it allows my students the ability to organize their mailing lists & to track their deals. Great software!!!" ...makes running this vacant land business much easier." I just purchased it, and it's a big difference having the CRM opposed to tracking everything in a spreadsheet! If you have the capital, purchase it!" It's a one stop shop, everything's there, from doing comps to all the documents. There is nothing in there that I don't use. I honestly don't think I would have 3 deals under contract right now without it." AND NOW we are making it available to you. What makes this CRM better than other similar tools like REI Blackbook, Freedomsoft, Connected Investors, etc...? While these systems are great CRM's in the real estate area, they are limited when it comes to customization, and any changes you want to make often requires quite a bit of technical knowledge. With the Investment Dominator you don't have to worry about customizing the deal flow process because it was designed solely for Jack's systems from the get go. What does the monthly fee cost and why? What can I customize in the CRM? 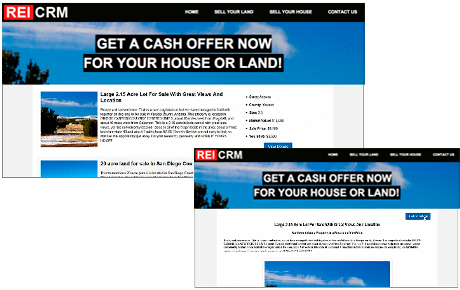 You can customize the appearance and text of your website and the company information printed on your mailings. You can also create unique documents and contact statuses that match your specific way of doing things. How is my data kept safe? The Investment Dominator runs from a cloud-based network that is backed up every week. In addition to our robust network reliability and redundancy, we give all clients the option of exporting their data at any time in order to create a secondary local backup on their devices. In other words, users of the Investment Dominator can have total control over their own data backups in addition to our system backups. Refund Policy: Payments are nonrefundable and THERE ARE NO REFUNDS OR CREDITS FOR PARTIALLY USED PERIODS.